Knowing my love of all things red meat Cinabar passed me these packets which were very kindly sent to us to try. Produced by Jack Link's Meat Snacks this Original Beef Snack, described as a "tasty strip of select beef - seasoned, cooked & dried", I immediately thought this beef snack was akin to beef jerky. I tried beef jerky once before, bizarrely accepting a piece from an over generous stranger on a train on the way back from a shopping trip. I'm not afraid to say that I absolutely hated it. It was bone dry, sucking all the moisture out of my body as I tried to eat it at the same time as almost pulling my teeth out as I tried to chew it. I reckon that it was akin to trying to eat a piece of an old leather boot. And I mean old as in long worn out, fished from the bottom of a stagnant pond and then dried in the sun, sliced and wedged together in a packet and sold at a premium price. Suffice to say that when Cinabar showed me a packet of this Jack Link's Meat Snacks Original Beef Snack, I may have worried a little! However perhaps I could be wrong about this Beef Snack...? Jack Link was established in 1885, so they must know what they're doing by now surely? The packet stated the snack is made with "quality beef", as opposed to poor quality! This quality beef is then finely chopped, seasoned, slow cooked and smoked. What did confuse me a little was that on the back of the packet it stated "100g Beef Snack is made from 142g beef". Cinabar explained that the beef would be dried and compressed to remove all the moisture from it to make it 100g. Presumably drying would be done throughout the cooking and smoking process, and compressing could be undertaken by making a surviving cow sit on it after cooking. Jack Link certainly take care in preparing this beef snack. "So what does it taste like?" I hear you ask. Well I opened the packet and was first hit by a rather smoky smell mixed with beef. The long slim piece of beef had a reddish tint to it. I took a tentative bite and was surprised how succulent it was and also how moist it was, or at least how moist my mouth was with every bite. The Beef Snack certainly didn't dry me out like that first taste of beef jerky. It was chewy, smoky, beefily tasty with light hints of onion and garlic. I honestly found this Beef Snack a flavoursome moreish treat that renewed my faith in beefy snacks. I was rather glad on finishing it to find out that Jack Link had sent us several packets. I reckon the packet would fit in a lunch box quite happily next to your sandwiches etc... You could dice this Beef Snack and put it in a salad or several on a sandwich if you want a smoky meaty lunch or have it with a beer and a movie late at night. Maybe that beef jerky I tasted way back when was part of an old boot after all? 25g packet at 100g there are 312 calories, with 12.6g of fat and 21g of sugar. 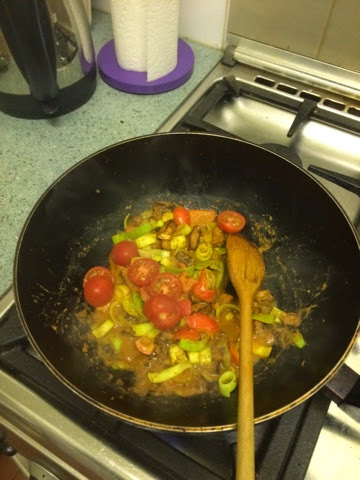 The high protein ingredients included; beef, sugar, soy protein, salt, maltodextrin, hydrolised vegetable protein, onion and garlic powder, smoke flavouring, flavouring, nitrite curing salt, rosemary extract and sodium erythorbate as antioxidants, and sodium citrate as an acidity regulator. I'm not a big consumer of white chocolate. I do like the stuff but I find that I eat less of it as it can be a bit rich, even for my sweet tooth. In some respects this is probably a good thing! Spectre is a big fan of white chocolate, but I managed to spot the “New” label on this one before him and steal his thunder. I did share it with him though - honest! This new variety is flavoured with cookie pieces and is a Milk and Cookies Sharing Block. The Milkybar chocolate had loads of biscuit bits, it was impressively packed with them. 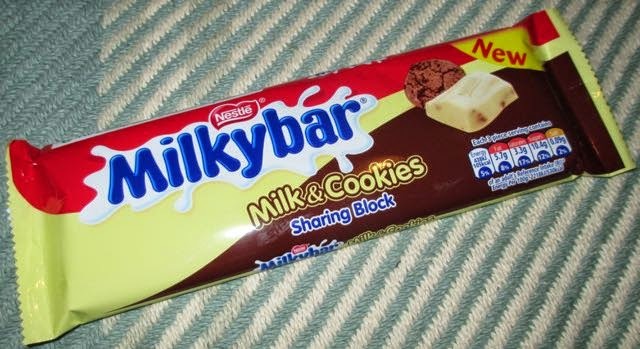 Full points to Nestle for introducing a new edition which actually looks really interesting, a nice twist on the after school idea of a glass of milk and cookies. It is a proper new flavour combination, I'm getting a bit tired of the varying “new” caramel products if truth be told. Back to this bar, the chocolate base is very sweet and creamy, but you have to remember the target market of Milkybar is a younger audience. Nobody tell Spectre. I felt the cookie pieces gave the bar a more mature feel, and made it something that could easily be shared amongst a group of adults. It is chunky too and feels pleasingly substantial. The cookie added a lovely crunch to the chocolate and the darker biscuit flavour was nice and a good contrast with the sweet creamy base. I quite happily munched two strips of this bar and felt content, so I do think the cookie bits changed the flavour enough to stop it being sickly. The pieces are lovely and chunky too. It reminded me how much I used to love white chocolate. 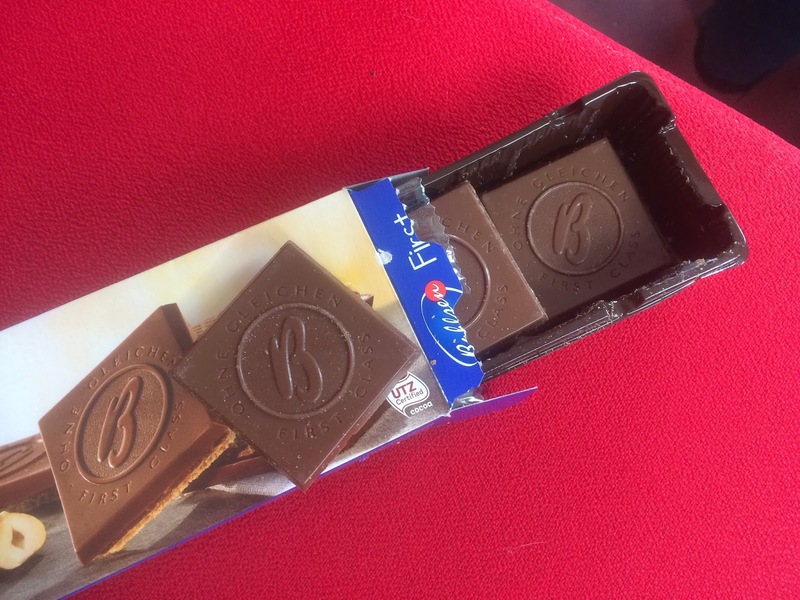 Yum - Bahlsen make some of the nicest euro chocolate on the market - with Choco Leibniz being a personal favourite (dark chocolate of course). When I spotted these in the supermarket (I can't remember which) I knew they had to be mine. I took them to work and squirrelled them away for a time when they would be most needed. That day was this Friday - so here they are! 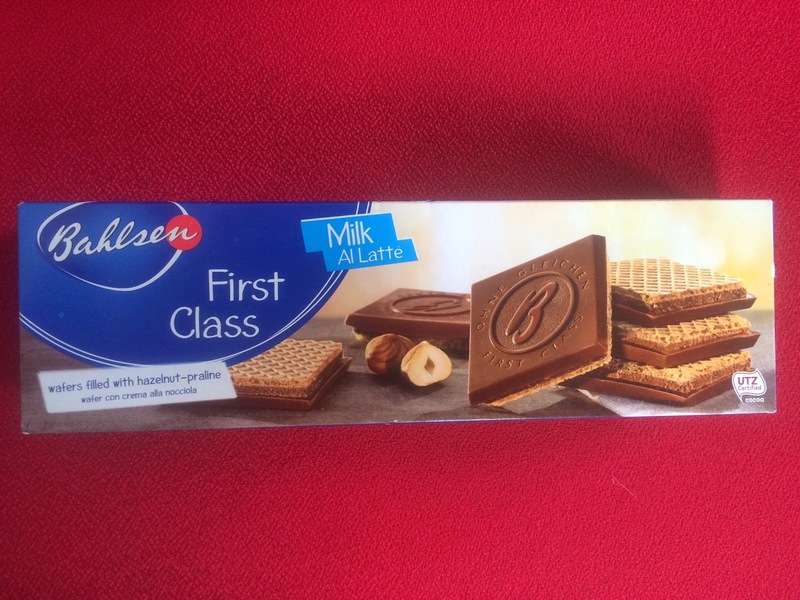 First class is a confusing little beast as it isn't actually a biscuit - it's a euro wafer snack, but in a box instead of a wrapper. I've reviewed lots of lovely wafers before - the best ones tend to be from the Polish grocery stores - but never one as posh as these. You only get twelve in a box and a portion really has to be two of them so that means that you'll get to please 6 people with one box (or one person six times). Like with other Bahlsen snacks the chocolate tantalisingly overhangs the rest of the snack, meaning it can be eaten in a variety of ways. The praline is sweet and nutty and hides in the centre between the two main ingredients, but is a full layer unto itself. 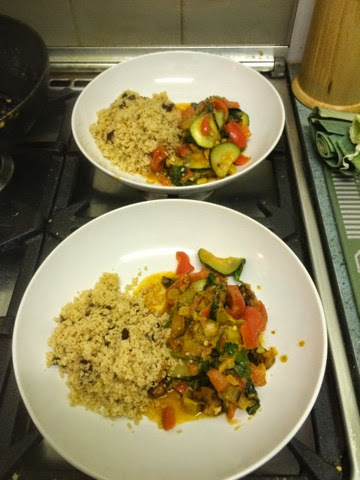 The result is as expected - an explosion of flavour and texture that causes you to devour it all and move on to the second without hesitation. Not cheap enough to have on a daily basis, but not expensive enough to be a one off these will be a nice thing to have as a treat and to brighten up grey Fridays. Truly deserving of the name First Class. 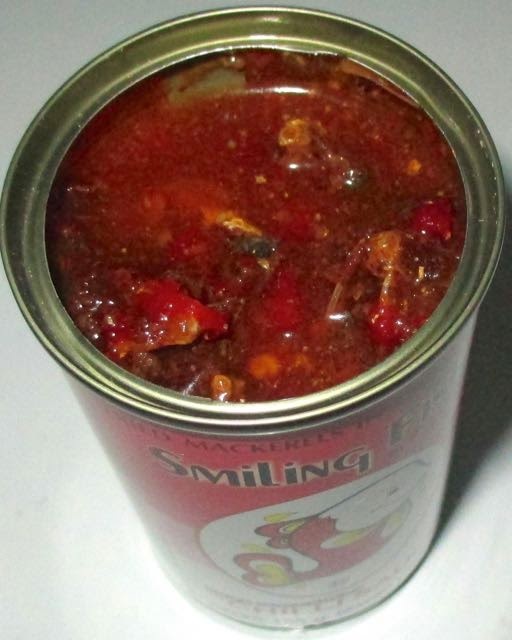 This tin of Fried Mackerels in Chilli Sauce was produced by Smiling Fish in Thailand. Smiling Fish or smiling assassin? The can had a redness to it denoting hot chilli. 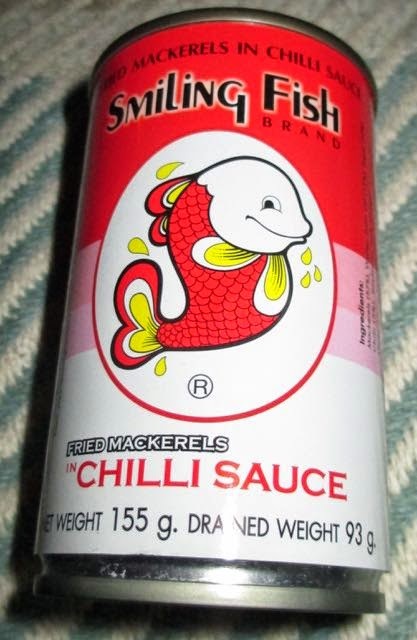 The fish image on the front of the tin was decidedly fire engine red in colour. There was even a serving suggestion on the front of the tin that looked like pieces of sumptuous mackerel covered in a very red chilli sauce. Net weight 155g, 93g when drained. 298 calories with 15.3g of fat and 15.7g of sugar. The "high calcium" ingredients included; mackerels (57%), water, palm oil (12%), sugar (10%), chilli (15%), soybean, salt, and vinegar. I fancied drinking a smoothy, with lots of fresh ingredients. As I was in the town centre I thought I’d have a look at the lovely selections of smoothies and juices in Marks and Spencer. As I scanned the shelf this green drink caught my eye, green because it is flavoured with peas. Now as much as I can appreciate fresh veggies and the new trend of adding something savoury to your smoothy (weirdly often beetroot) peas were still a new one on me. They appealed more than beetroot though, which everyone knows just tastes of soil. The combination of pea and mint felt like it might taste like a soup but I was hoping the apple and lime would balance things out. I poured it into my glass and it is hard to get past the green colour of the drink, it isn’t that appetising to be fair. It is also quite thick. It smelt sharp but I gave it a sip and discovered the taste was quite sharp too. I think it must be a combination from the lime and the sourness of the apple, but it gave the drink quite a bite. Far zingier than expected. It took a bit of getting used to, but it grew on me the more I sipped. 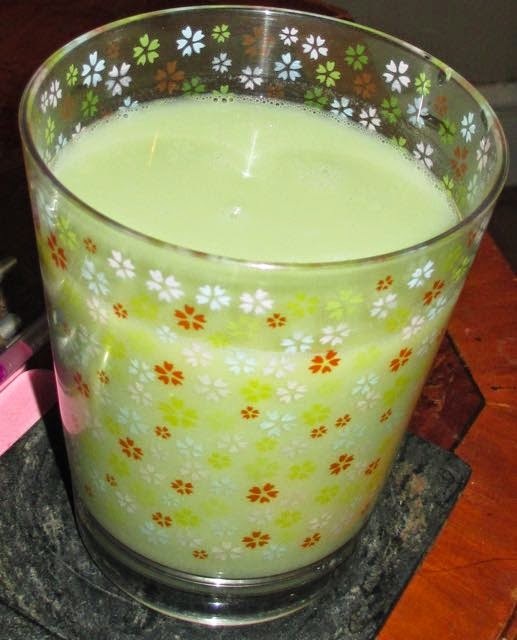 The pea flavour is present but it isn’t too strong, and it is the mint that gives these quite a refreshing tang. Once I had got used to it I realised that each glass is worth two of your five a day so that is an extra bonus too! The day before Valentines day here in the UK a parcel got taken to a delivery depot we'd never had to go to before. As we were not expecting anything we wondered what it was and went over the following day. The post office in question was in a lovely little urban village tucked away on the outskirts of Birmingham. 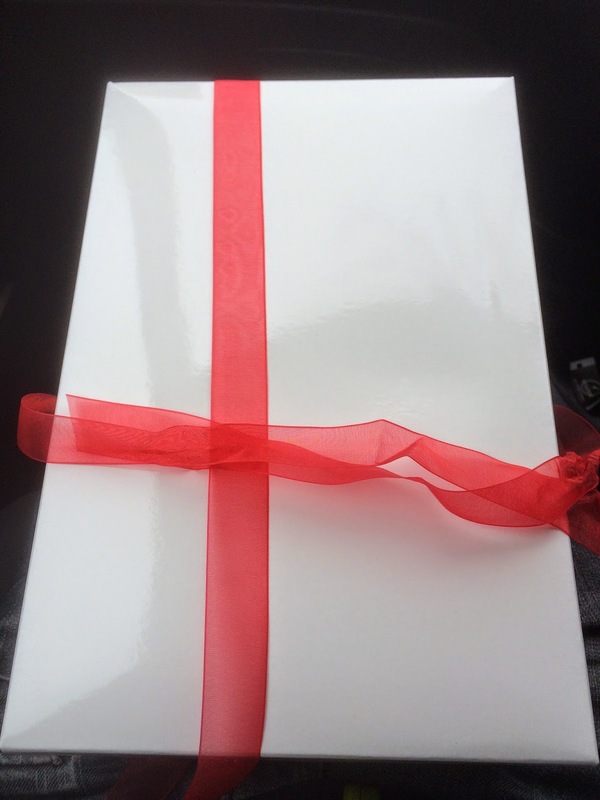 The package was for me and looked very swish. Turns out it was a box of fruit from South Africa. I've never really thought before about the various countries we get fruit from - other to be jealous that the things we own have been to many more exciting places than we have. As the card points out these imported fruits are actually vital to the economies of these developing nations and fruit farming is a big business. And what large fruits these are! They were strong enough smelling to attract a curious kitten and had survived the journey well. 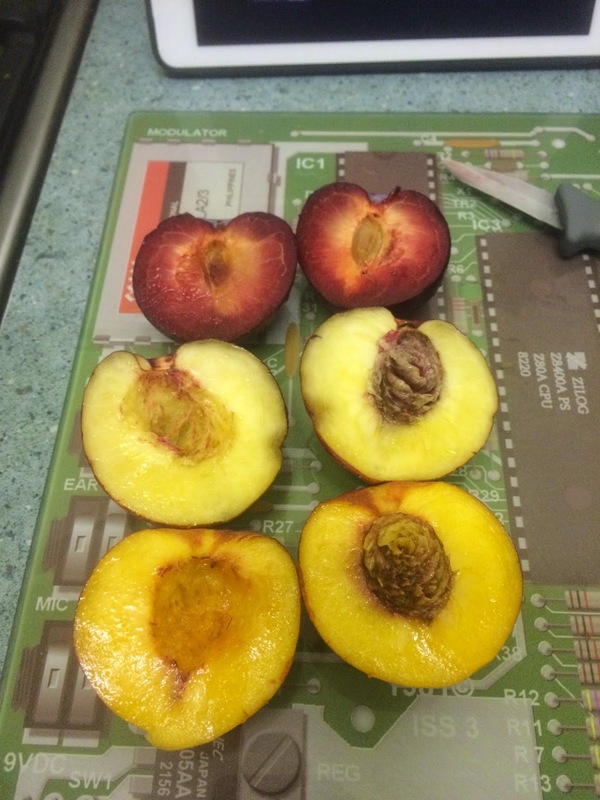 I believe the three are nectarines, plums and peaches. We even got a nice mug! We refrigerated them and a couple of days later chopped them up and made a very simple fruit salad. I really liked all three flavours, with the plums being my favourite. My partner disliked the plums saying they tasted like nail varnish so in the above example I got a whole one to myself - result! I think that these fruits are not something I'd ordinarily consider dropping in the basket. Bananas are my usual fare, with the odd Granny Smith apples thrown in to be chopped up and eaten. 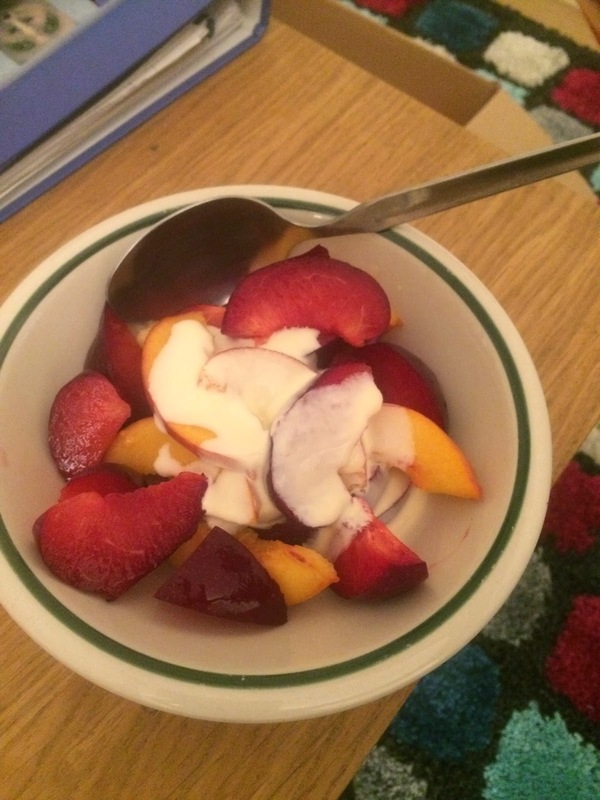 I think that I enjoyed this healthy pudding enough to consider buying again. With a little more variety in it too I can see it becoming a regular treat. I've no idea whether the local greengrocers actually sell South African fruit so I'll have to pop in and find out. Made by the Kiuchi Brewery in Japan this rather cute beer bottle caught my eye in the local supermarket. Described as a "white ale" this beer is brewed with wheat malt, and flavoured with coriander, orange peel, and nutmeg. The bottle very politely stated; "please enjoy the soft and flavorful taste" and then took my photograph! Just kidding, but the Japanese are rather famous for taking lots of photos when abroad and why not? It's good to have something in your memory to remind you of a good time. I suppose that's why the rather clever looking owl image on the bottle and cap caught my eye. Cinabar loves owls and I couldn't help but think of her when I picked up the bottle. She has lots of t-shirts with owl images on them. One of which I call the "Zombie Owl", which freaks me out whenever she wears it as it's baleful gaze seems to follow me around the room! Anyway, I digress... This lively beer poured fizzily into my beer glass. I noted its misty wheat beer texture. It had an orange smell mixed with a leafiness and wheaty background, if that makes sense? I immediately figured that this beer would be perfect with a fishy meal, which is good because that's what I've got tonight! Even though it was strong in the odour, the orange peel was slightly lost in the taste, so was the coriander and nutmeg. All these flavours delicately merged with the wheat malt producing a refreshing and refined taste that danced gingerly across my palate, with no real bitterness. Good stuff this, but I'm saving some to wash down my dinner... Right, bring on the fish and Ant and Dec's Saturday Night Takeaway! Now when the courier arrived this morning and dropped off my order from Tassimo I didn't think there would be anything blog worthy in the box. This is not to say that I don’t find Tassimo blog worthy, it was just that it was a semi-regular topper up order. I got some Chai Lattes as they aren't available in the shops, Milka hot chocolate for the same reason and a couple of different makes of latte mostly to top the order up enough so that I could use a voucher that was emailed to me to get a free Milka mug. On a side note I am a Milka fan girl, which is why I order this hot chocolate from the Internet. Clearly then when my new mug arrived I immediately wanted to make a Milka hot chocolate in it. This is when I noticed that the Milka t-disc had a make-over and it was a new recipe. First thing to note most of the hot chocolates in the Tassimo are made using two discs, one milk based and one chocolate based, both of these are usually liquid. Even Suchards one disc variation is still liquid filled. I was suspicious then when the I spotted the Milka Tassimo had been reduced to one t-disc and, when I shook it, I realised it was just powder. Oh my, that didn't bode well. I popped my new mug under the Tassimo, inserted the t-disc and started it off. 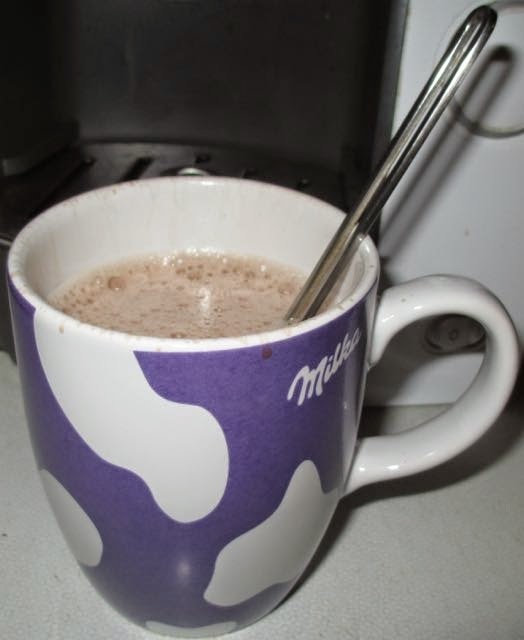 Now this is the official Milka Mug from Tassimo and I'm making the official Milka Tassimo hot chocolate in it, so why on earth doesn't the drink fill the mug? Seriously where is the rest of my drink, you couldn't serve someone that in a cafe, it looks dreadful leaving a huge gap at the top of the mug. There is a top-up mode on the Tassimo but I didn't want to have to resort to that when I'm taste testing as all that does it add extra hot water. 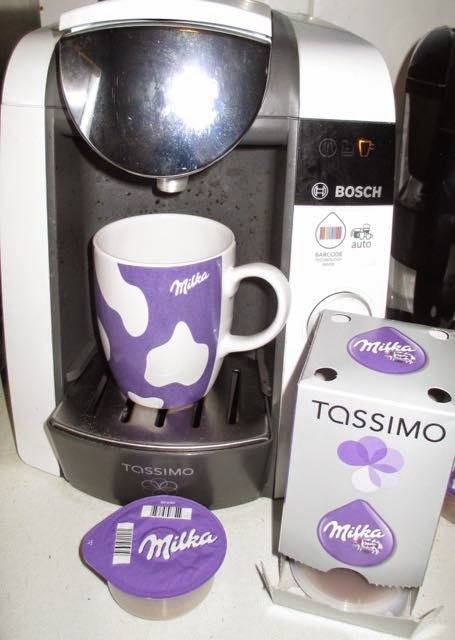 Surely the Milka Tassimo hot chocolate should naturally be an exact fit for the Milka Tassimo mug? Apparently not. Issue number two occurred when I went to take out the used t-disc from the machine and I could see powder (still dry in places) and some soggy cocoa slush still within it. I could see it hadn't mixed completely. I did later try a second Milka with the same results. This is the brand new bag - it's barely half full! Granted there was plenty to go around and I'd have struggled to eat a whole bag to myself but it was a little deflating to see what looked like a tiny portion from the nice big bag. 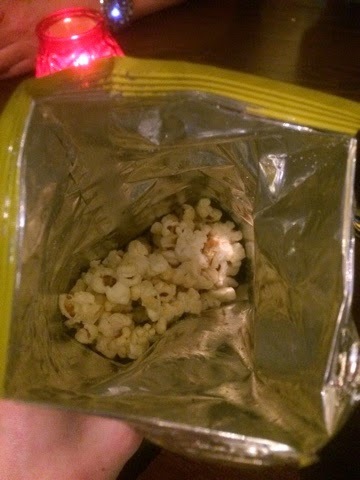 I guess it's so the air of the inflated bag protects the kernels but still - instant sads. We shared it around the table and then I ate the remainder. Some found it too lemony but I was chasing the bits with all the flavour stuck to them as I quite enjoyed that. The fennel wasn't that strong and balanced it out nicely. 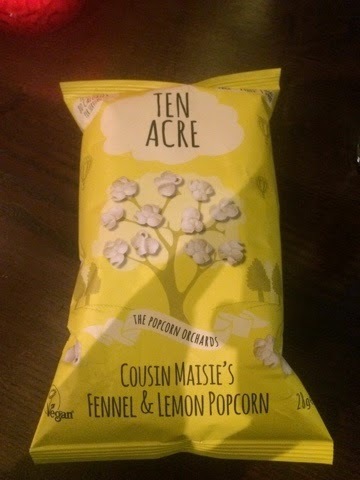 Unlike the dreaded Snack A Jacks this wasn't polystyrene sprayed with flavour dust - this is actual popcorn that tastes of actual things. 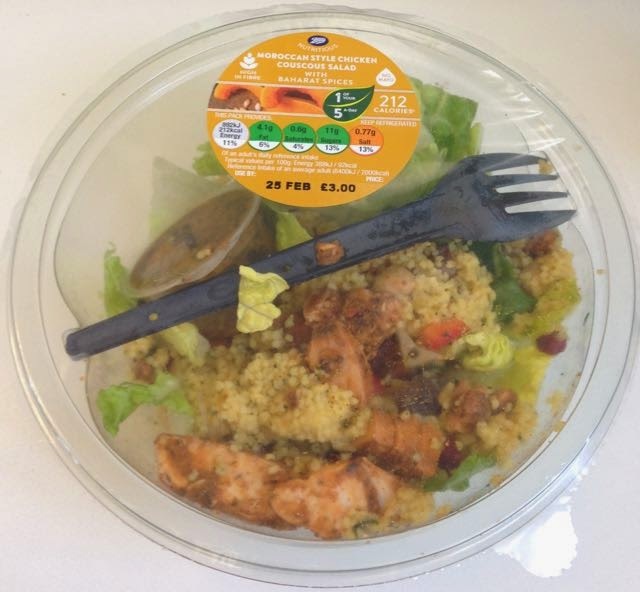 Despite my first impressions this turned out to be a really lovely snack - more of a starter than a meal though - and I plan on getting more of them. The name seems to hint at being a quote from a film I've not heard of as it is a bit long and confusing. Maybe I should have a Google and see what comes up. 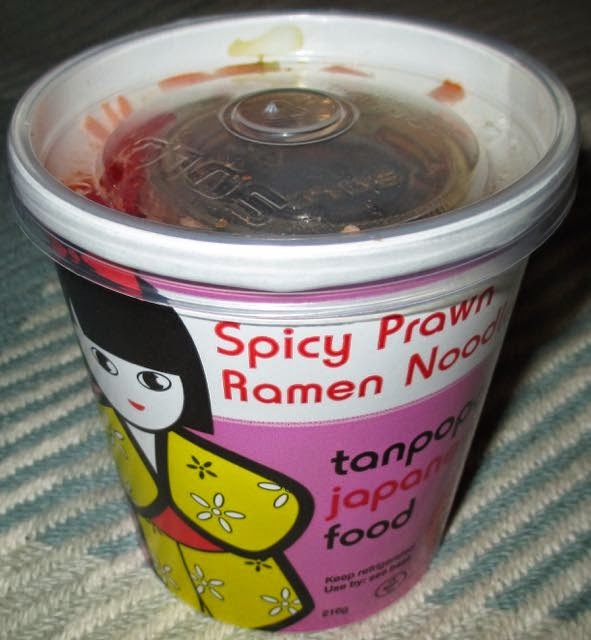 This pot of Spicy Prawn Ramen Noodles was produced in the UK by Tanpopo Japanese Food. It had an image of a cute traditionally dressed Japanese woman on the front of the pot and was literally brimming with ingredients. I wasn't quite sure where I was going to fit the sauce pot or the freshly boiled water. A quick meal to prepare (unless you have a slow kettle like mine) with only a minute to stand with the lid on after adding the freshly boiled water. Stir and you're ready. One thing that struck me though when removing the lid was that there was no seal. I popped the lid and was straight to the food. This gave me a bit of an uneasy feeling. There was a lovely sweet and spicy Bonito Tsuyu sauce smell emanating from the steaming pot. I could see the odd dangerous looking piece of red chilli milling around the multitude of noodles, vegetables and prawns, which made me worry a little on the heat levels of this noodle pot. Perhaps the traditionally dressed Japanese woman should have been in red rather than yellow? There was only one way to find out, so I dug my fork in. A multitude of tastes hit me with every lash of long noodles against my lips (and sometimes chin). All the vegetables mixed together with the sauce, noodles and prawns making every mouthful slightly unique. A journey of tastes like a life in a pot of noodles. It certainly had the odd burning smackdown from the chilli pieces that made my nose run a little. Dipping in some bread I found the sauce had a predominantly soy taste to begin with and then a fishiness and a kick of chilli at the end. 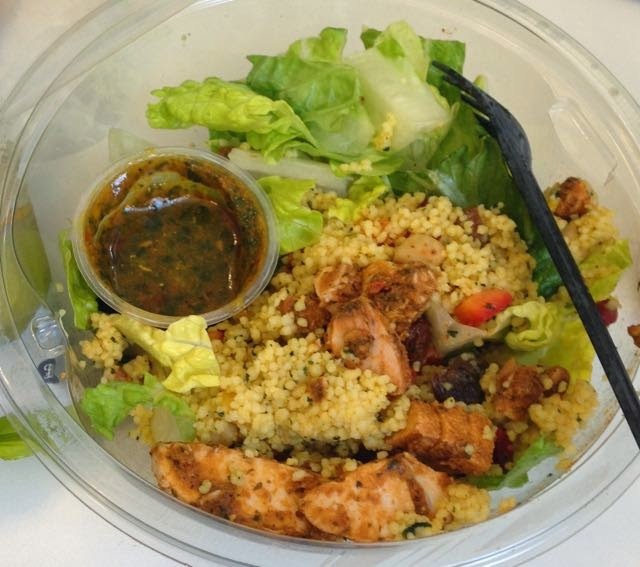 This filling healthy meal cooled quite quickly in the cardboard pot, which with a little bread for dipping made this a very quick and tasty meal when on the go. 216g pot with 227.6 calories, 8.4g of sugar and 2.4g of fat. Ingredients included; Ramen noodles (49%), Bonito Tsuyu sauce; fish, soy sauce, water, salt, soy beans, wheat, bonito, natural brewed alcohol, yeast extract and vitamin E. Also spicy prawns (12%), sunflower oil, dried chilli, coriander, and pieces of carrot, Chinese cabbage, spring onion, edamame soya beans, sweetcorn, red chilli, and coriander. Store in the fridge. Not for vegetarians. 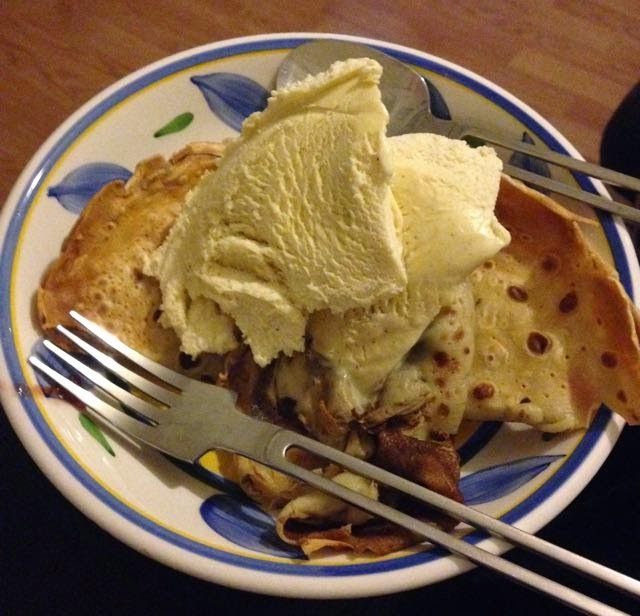 Firstly let me start by saying Happy Pancake Day!!! What better way to enjoy the day than by cracking open a brand new frying pan. 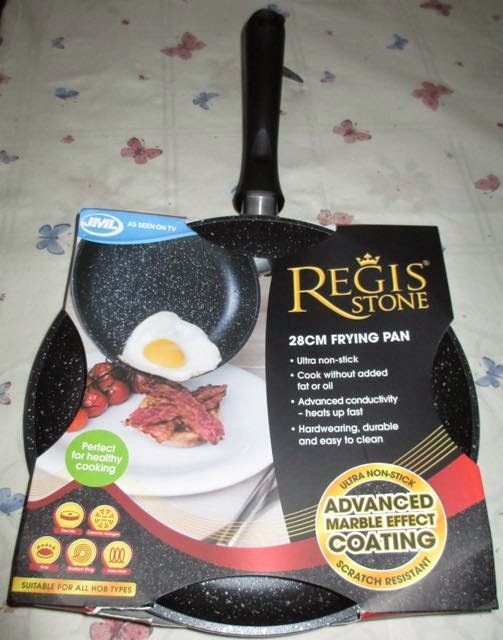 This new one is from the Regis Stone range from JML and isn’t just non-stick it is ultra non-stick! It is made from a stone hybrid which also ensures that items are cooked evenly and it heats up quickly. It is non-scratch too, but I think that is something that needs time to judge it. I have to admit to having seen on TV some infomercials for the new ultra non-stick pans, the Regis Stone one from JML seems to be very impressive so I thought it would be fun to try out our new one on Shrove Tuesday. We added the batter to the pan in order to make the first pancake, and it did feel odd not adding any extra oil before hand, but that is supposed to be the magic of the pan. After a suitable amount of cooking it came to the flip, which actually means a turn with a spatula, but you get the idea. 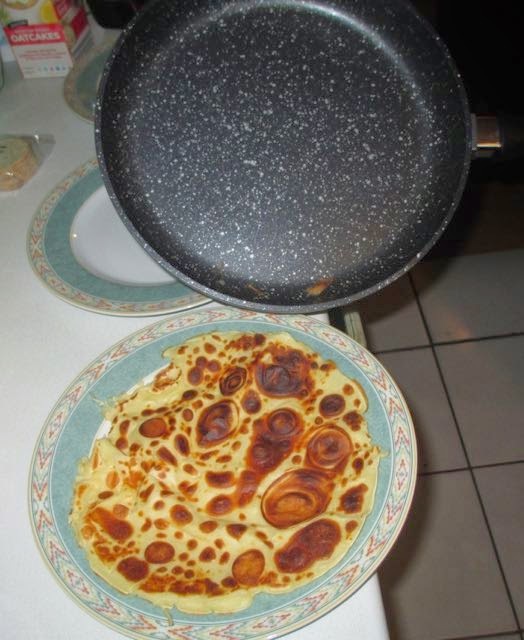 Impressively the pancake came away easily and both sides cooked really well. Just a quick review this morning to show off this cute new bar from Cadbury for Easter. It is essentially just Dairy Milk with a white chocolate decoration of white rabbits. I have an affinity for rabbits, particular white ones so this did make me smile. Im sure my family will be suitably amused too. There isn't much white chocolate on the bar, just enough to show off the design really. Some the white does bleed a little into the base too which isn’t very neat. You can see under some of the bunnies in the photo but taste wise it doesn't really matter. The underlying chocolate is the aforementioned Dairy Milk so all the creamy sweet goodness is there. It is a soothing chocolate providing the expected sweetness fix. It's a nice novel bar for Easter just with a very slight seasonal twist. 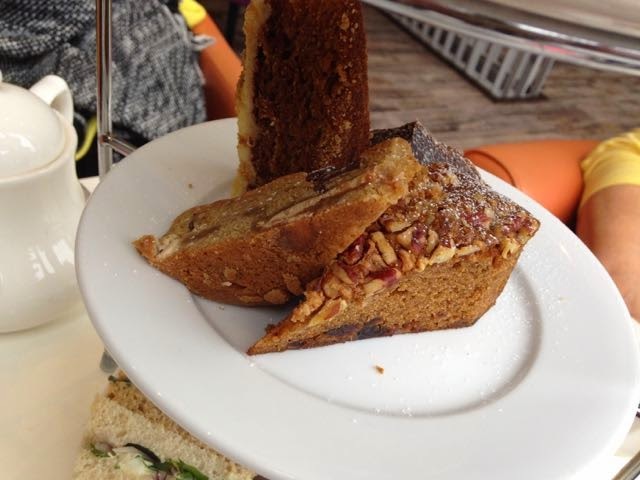 I was very kindly gifted afternoon tea for two at The Lounge in The Club and Spa at The Cube in Birmingham’s Mailbox as a birthday treat. 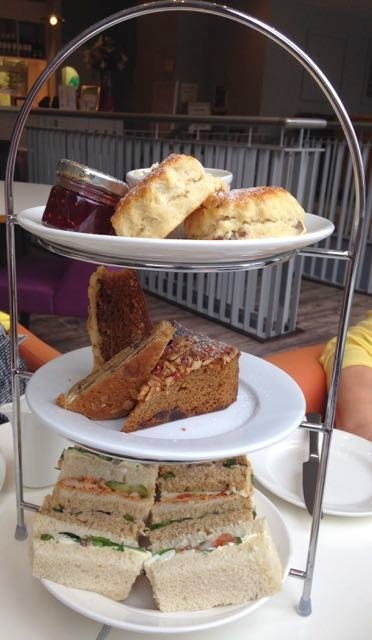 Although I’ve seen afternoon tea available at hotels etc I’ve not actually experienced it as a whole, so I was really looking forward to this. 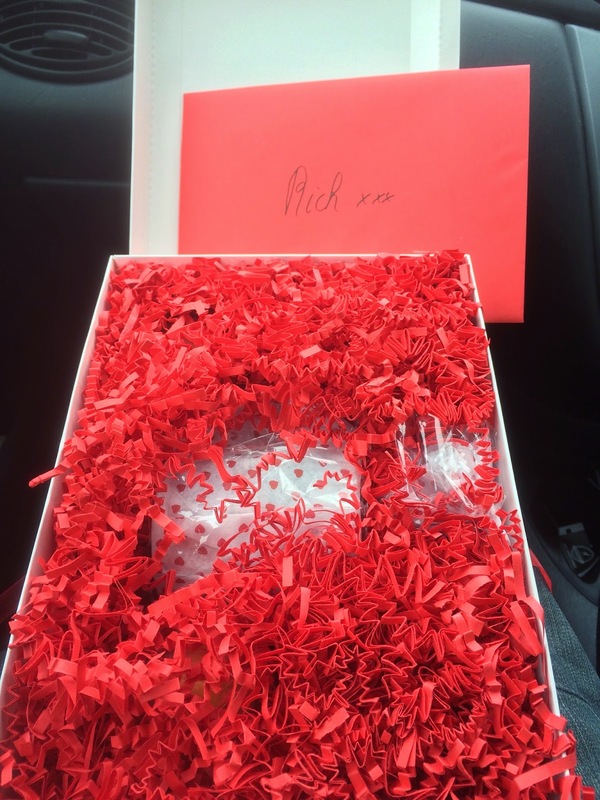 The gift was in the form of a Groupon voucher and advised emailing to organise a date and time. I emailed and request a Saturday (I gave choice of four Saturdays), stating that I didn’t have any preference on the time. I had a simple reply back; “Thank you, booking confirmed for the Sunday 15th @12 noon”. I replied querying this and pointing out I’d requested a Saturday, and got a short reply stating just “Weekends are fully booked”. After several more emails she confirmed it was Saturdays which were fully booked, so we went with the Sunday as originally suggested. Not the best booking experience to start things off. We arrived in Birmingham by train. The Cube is situated in the Mailbox district of Birmingham and although it has been quite a while since my last visit I thought I knew where we were going. As the train pulled into Birmingham New Street I explained to my mum that if we left by the stair case at the extreme end of the ‘a’ side of the platform we would end up on a staircase that would lead us out close to the Mailbox. I had forgotten that Birmingham New Street was undergoing extensive renovations and that exit was closed. We found our way using a different exit, and headed on to the Mailbox. We arrived at the steps to the Mailbox entrance to find it closed off too, covered over and again going through major renovations. We weren’t sure where to go, but checked the poster next to the building works. We had a walk down a side street, not sure if it was the right direction it wasn’t the nicest area, and then into the Mailbox through a strange side entrance. We could over hear other people trying to work out where to go too, and trying to find the entrance to Harvey Nichols which seemed impossible. After the entrance to the Mailbox the place was still in a state, and we walked through a thin corridor covered in builder’s white plastic sheets, it led to a single up escalator, I noticed that the down escalator was missing and realised it was going to be another adventure trying to find our way back! We had a little time and thought we too would try and find Harvey Nics before our afternoon tea, but we failed. We found a lift that advised us to get off at floor 2 for the store, but that was all closed up with building works when we got out on that floor and had a look around. We wandered about a bit more, tried a few more floors and realised we were running out of time so went back on the case of trying to get to our afternoon tea. We went back to the floor with restaurants although it wasn’t tidy or clear how to get to the shops, we did work out how to get to the Cube so followed our path. Now the place we were going is called “The Lounge” which may not sound like the most imaginative name, and it turns out it isn’t. Also with the Mailbox Quarter is a Ramada hotel, you have to walk past this to get the The Lounge at the The Cube and guess what they called their bar/restaurant, yes also “The Lounge”. What fun. 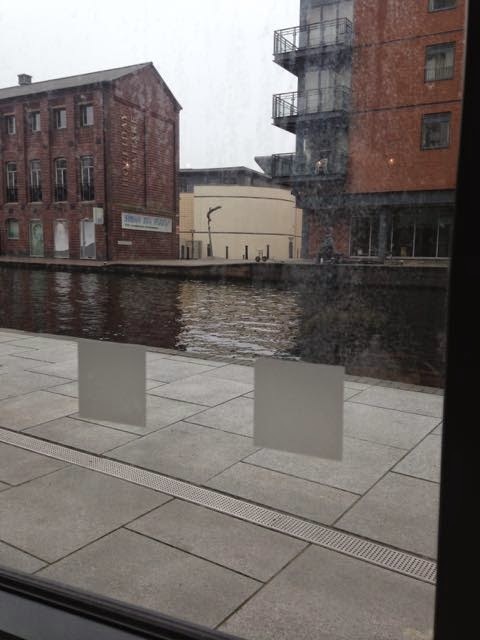 We walked along the canal and into the The Cube, I’d read online that the The Lounge was on the lowest level overlooking the canal, so we followed the escalator to the bottom floor and indeed saw the door to The Lounge. Finally! It was only when we were up close to it I spotted the door had a cupboard behind it and was sealed off, oh. There was a sign saying we should use the entrance on the sixth floor, at which point we noticed we were on a floor labelled as fifth (despite it being the bottom), its like Birmingham is trying to confuse visitors. Up one floor and we made our way in, through the entrance which is actually outside (and therefore still not clear) but miraculously we were on time and very much ready for afternoon tea. It was disappointing then to discover they had no record of us having a booking for afternoon tea. I ended up having to fish through emails to find the proof of the booking, the receptionist at the lounge thumbing her way through the stream of messages on my phone, before we were able to be seated. I have to say when we finally got to relax we did rather like the surroundings and the fabulous canal view from our table. We were offered tea or coffee and we both opted for coffee. It came in a lovely big pot and we shared some out. The cups were very traditional and smart but fiddly as the gap in the handle isn’t big enough to put your finger through. 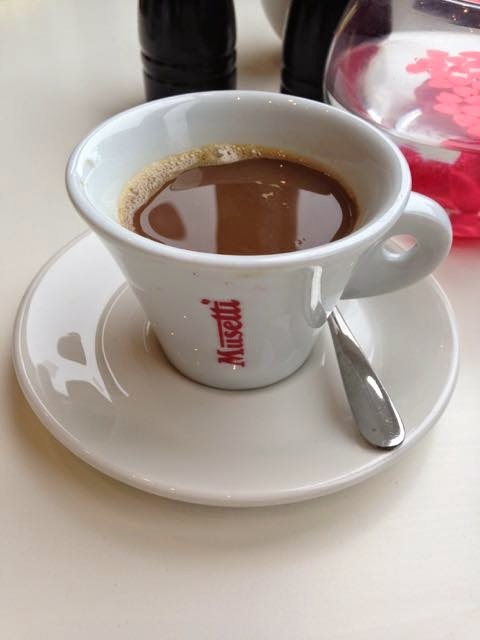 It was a very welcomed and refreshing cup of freshly brewed coffee though. After a brief wait the most beautiful tiered tray of goodies came through. There were finger sandwiches, a selection of cakes and on top scones with cream and jam, heaven. A worthy reward after our Birmingham exploration. We started on the sandwiches there was a selection of tuna, egg and spicy chicken. The crusts were removed as per tradition and so looked very dainty. The different breads were fluffy and thick cut, and I loved that the fillings all had fresh crispy additions of salad and onion. 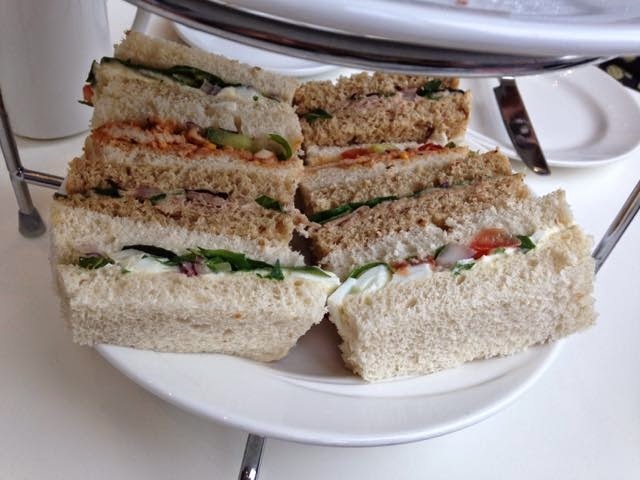 The chicken was a mild spice and the sandwiches were all very pleasing. My mum pointed out that the correct etiquette was to tackle the scones next. These were thick and full of juicy currants. There was plenty of cream to share, but one single serving jar of jam seemed a little light for two. I went for jam first then cream. Either way is okay, unless you are in Devon and Cornwall where apparently it matters! 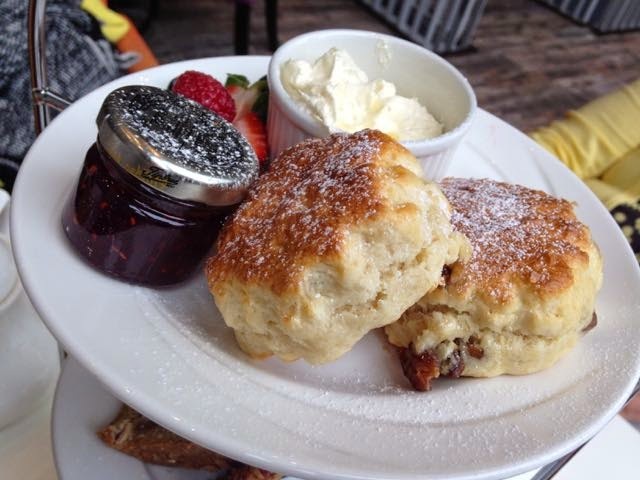 Again the scones were fresh and tasty, and very indulgent with their lashings of cream. We let our tummies settle before tackling the final tier. We sipped coffee, relaxed and watched the boats go by and the fisherman across the way make a catch. When we were ready we went for the cakes, I chose the chocolate brownie and the carrot cake. The brownie was rich, soft and full of rich chocolate flavour. The carrot cake was well spiced, moist and indulgent. My mum loved her cakes too, coffee and walnut and a cake layered with chocolate chunks and goodies. Again we relaxed and finished our coffee. The waiter was very attentive all the way through checking on us, and offering us more coffee, he did make us feel comfortable and welcomed. The food too was spot on, far too much cake which is exactly as it should be. I would certainly go back for a treat, at least now I’m confident I could find it again. After our afternoon tea we decided we were refreshed enough to once again attempt to find Harvey Nichols. After trial and error, and a pinch of luck we found our way. Apparently you have to walk back to the Mailbox, go to the far back corner, slightly hidden by the building works, take the lift to the lower ground floor, walk across a lengthy car park, find another lift again slightly out of the way and the take that up to the second floor. Simple really. We had a brief look at make-up and nail goodies. A glance at few other bits, but this being Foodstuff Finds, the food hall was high on my agenda. It was disappointingly small, not so much a food hall really, more just a few shelves after all of that. I didn’t buy anything, shocking. I think the whole area of Harvey Nics has been condensed during the building works, so some of the food hall has disappeared. Either that or I imagined it was bigger than it was last time I went. We did enjoy our Birmingham adventure, but the tourist board there must know how much hassle all the on going works is causing, it has turned the place into a bit of a maze, which is such a shame as there are some really nice treats hidden away within that, including After Tea at The Lounge. We were contacted by Cauldron foods and asked to show how we use their ingredients in everyday recipes. As we already had some in the fridge I just took pictures the next time I made something. 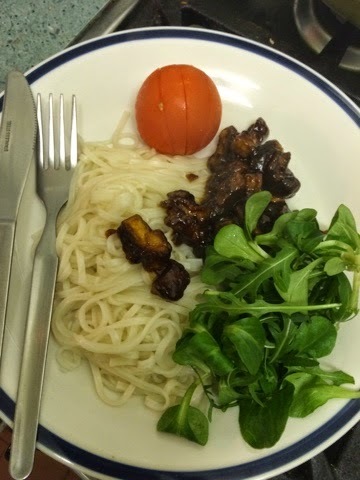 Here we have BBQ style tofu with noodles. Yum! 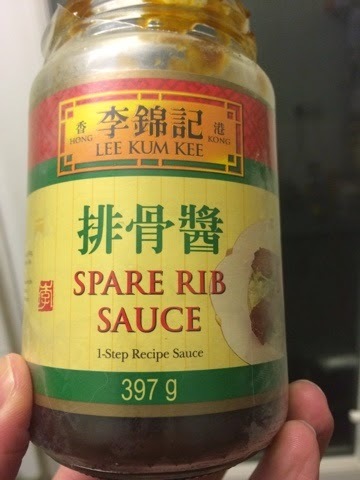 To start with - if you want that take-away tang that spare ribs have on your home cooked food you have to get the right sauce. I've never been disappointed with Lee Kum Kee and I'm sure that some of the restaurants I visit use the industrial size versions of these. A little jar like this goes a long way as two dessert spoons of sauce was enough for this meal. Tofu absorbs flavours in the way that the finest cuts of meat do so you don't need to go overboard. 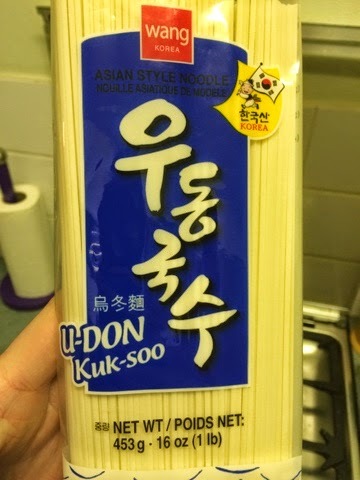 Thin udon noodles complement this well and I've tried many different varieties. These just happened to be the ones in the cupboard - quick and easy so far. 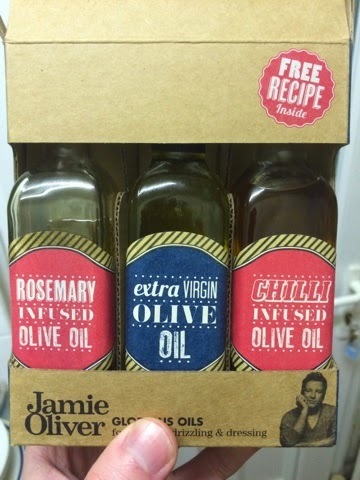 I just used the extra virgin Jamie Oil we got for Xmas as the BBQ sauce is the main flavour. 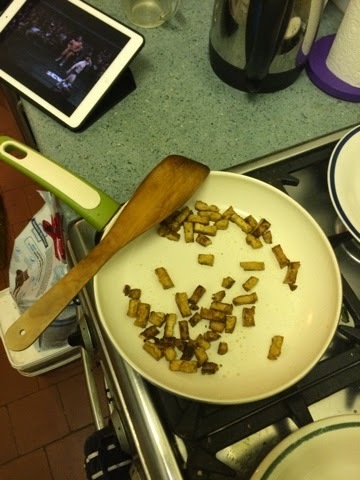 Using a good oil to crisp the tofu up first really helps the texture. Typically I'd thrown out the outer packaging and forgotten to take a picture of that but this is the pre cut Cauldron tofu. You can buy the blocks and cut and marinade your own in the sauce overnight for a deeper flavour. With the precursor stuff you just open and fry so it's a lot faster. And while you are doing that you can catch up on the ongoing soap like drama that is ICW on your iPad! Adding the sauce really brings the flavours out and it thins in the heat meaning you really do get a lot of meals for one jar. And there we go. 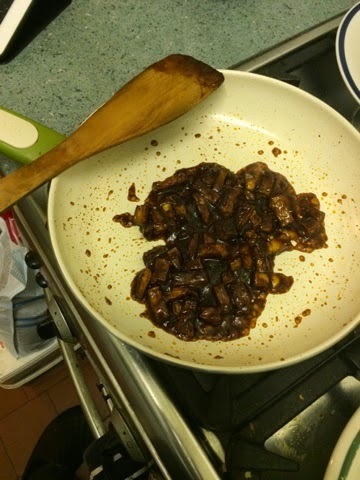 15 mins later we have a meal for two ready for the Kikoman soy sauce and polishing off. Vegetarian, and with the flavours of the take away, superb. I've tasted many teas in my time, enjoyed most and hated others. The ones I hate are generally flavoured with some fruit or other. "So why pick up a mandarin flavoured tea?" I hear you ask. Well, to be honest with you, I have no idea. We were having a nice day out at Trentham Gardens and it was the first time I'd seen a Whittard's shop for ages. I guess I got caught up in the moment when Cinabar said the immortal phrase; "I'll treat you to a few boxes of tea." Greed took over. I must have thought at the time that this tea may taste a little like Ceylon Orange Pekoe, which is indeed one of my favourite tea blends. There is a subtle taste of orange there, so perhaps I was hoping for that here too? Not that I'm the type of person who regularly sniffs teabags or sees anything wrong in doing so, but I couldn't help but catch a strong whiff of orange and grapefruit as I opened the packet inside the cardboard container. This was quite a pungent smell and it set alarm bells ringing straight away. Indeed there were bits of orange peel in the teabag, which tried to distract from the bitter grapefruit smell. I followed the brewing instructions leaving the teabag in the mug's freshly boiled water for almost five minutes. The tea was pretty dark by then, but the container stated not to add milk. Once brewed I noticed this very dark tea had a woody smoky smell to it. Like the damp burnt charcoal around the muddy outer circle of a campfire on an early morning after a particularly heavy dew. After sniffing far too forcefully I gave up trying to find the previous strong orange and grapefruit smells from the teabag. This tea was going to be a tough customer. Yet on first taste I noticed the earthy smokiness had mixed well with the orange and grapefruit flavours. Instead of biting away at my tastebuds the strong flavour of grapefruit was offset by the orange peel, both working together to calm the muddy dark brown dead wood fire flavour of the Puerh. I can see why the tea masters at Whittards added the fruit flavours now, and fully appreciate the delicate fruitiness merged with the strong aged Puerh. Remarkable. 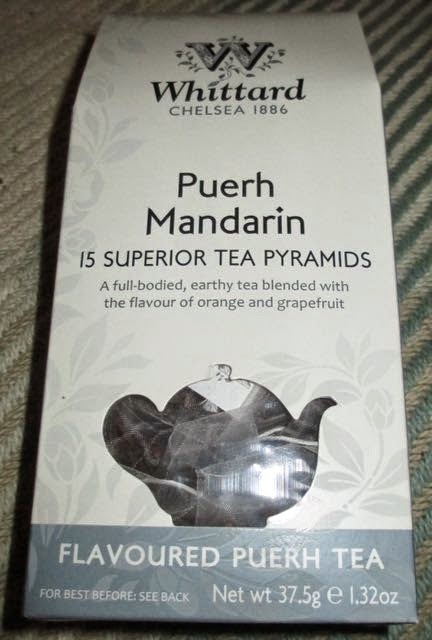 15 tea pyramids at net weight 37.5g. Produced by Whittard of Chelsea. Ingredients included; Puerh Tea, orange peel, natural orange flavouring, and grapefruit flavouring. Yay there are new desserts from Cadbury on the shelves! My mum spotted these fine puddings in Waitrose, saw the ‘new’ label and picked them up. Now this being 2015 which is looking like it is going to be called “the year of the caramel take-over”, they are of course caramel flavoured. For the record I consider 2014 as the Caramel Invasion, but this year it is really making its presence known, now it has established itself on our shelves! I do have to confess my inner child did like the made up word name though; Caramellionaire. 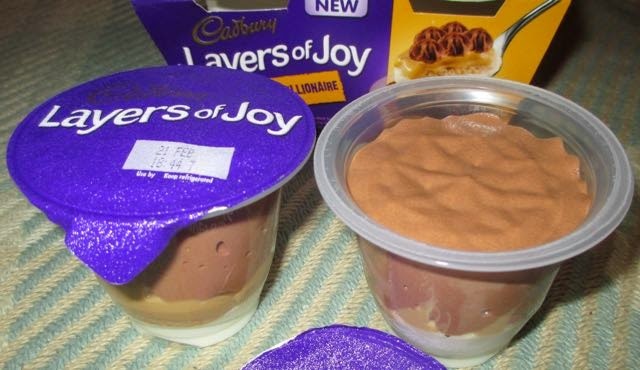 Cadbury has a number of desserts out in the “Pots of Joy” range but I think this is the first one I’ve seen in the “Layers of Joy” selection. Effectively the pots are bigger and clear, so you can see those lovely layers within. When I peeled back the lid the first thing I noticed was the topping of chocolate mousse looked very different to the chocolate mousse pictures on the packaging. On the card it looked very neatly piped, with a smart design, but it looked almost flat in real life. The mousse however did taste lovely and chocolatey, so I shouldn’t really complain. The next layer was fab, it was thick gooey caramel, and it had a rich sweet soothing taste. It reminded me of a traditional butterscotch flavour and was a pleasure to eat. There was a layer of sponge next, it was one of those discs of sponge you so often get in desserts like this, but it was at least a little moist and nicely soft. Finally there was a creamy layer at he bottom, which finished things off nicely. Yes it is a caramel flavoured dessert, but I did enjoy it. 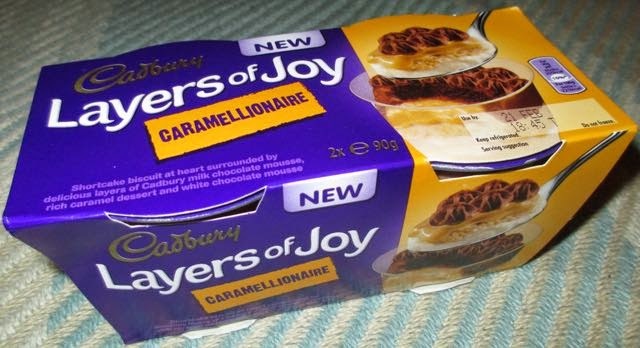 I also can’t wait to see what else cadbury release in this new Layers of Joy range. Ooh look - a perfectly normal Thai Curry stir-fry dish. I wonder what makes this review worthy? In this particular instance instead of diluting the insane amounts of red curry paste that I love with coconut milk I used oat milk! I first heard about Oat Milk through the Journalist/Comedian/Secret Dancer Andrew Collins and always meant to give it a try. Eventually I managed to secure some and then it only took a week or so to pluck up the courage to open it. 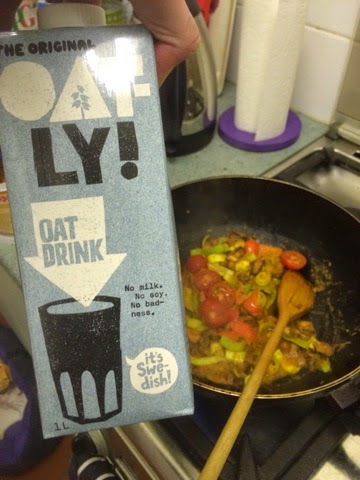 Ok - so this probably isn't the most suitable use for this drink (they even do a thicker version that I couldn't get designed for cooking) but as I'd run out of coconut milk and had this open in the fridge it made a good substitute. I'd opened it a few days before to try as a drink. I shook it enough to make it thicker (the 2nd time...) and it tasted like a mid way between soy milk and dairy milk. The flavour was a bit weak but neither that nor the texture were unappealing. As someone who adores blue top full fat milk this would not sway me from choosing that as a drink so to avoid it sitting in the fridge I decided to try it in other foods. And it works fine. Sure, it'd be better thicker but it diluted and complemented the curry paste well and didn't cause any problems for those of us eating it. As coconut milk is also vegan this didn't really change the status of the recipie, but it did open up another flavour option. I had a spot of bother actually finding this product and typically didn't have the vouchers on me when I located it in Sainsbury's. I picked up one of the blue original, and one of the brown chocolate version. I don't seem to have taken photos of that one though, but as I'm likely to pick more up I can add them at an appropriate time. Essentially this does change the status of the product - vegan milkshakes are possible. And not only possible - they are quite nice! I think I'd have it with a stronger chocolate taste, but if you gave this to someone without an oat related warning they'd probably not know. Like the original the texture is closer to water than milk (so more in line with skimmed) but this isn't a problem. I want to try both the original and chocolate varieties with Weetabix as I think the mixture would be superb. I also want to make my own milkshakes and hot chocolate to test that out too. I better try it in tea too. Ooh and the ice-cream maker. Once I've had a proper play with it I'll know whether it's a fad thing that I'll probably not get again, but at the momenti can see choosing the chocolate oat milk over a traditional shake for a nice change.